The basket of flowers on the left is arranged by my wife Emily four years ago for a client who wanted to surprise his wife on Valentine's Day. Upon seeing the basket, he was overjoyed and hurried to bring it to his wife. He was all smiles the next day narrating how his missus loved the flowers. 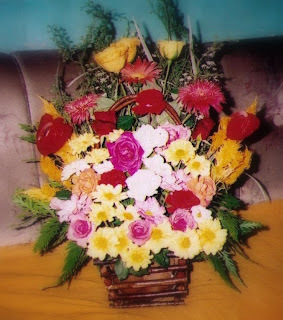 Friends, if any one of you wants to order flowers and send it to someone dear to your heart here in Cebu City, we can help you. Whether it be a bouquet or a basket of flowers, we will beautifully arrange and deliver it for you. We don't have a flower shop yet but we do accept orders. For details, you can email me at noverei@gmail.com. If you want to see some of the pics, just click on any of the flower pictures below my blog header. For the 2009 orders, click here > > >. Steph, i'll qoute your comment ha in my online flower shop in the future. theysaywordscanbleed, thanks for the visit!